Last updated by Frankye at January 13, 2014 . Update: we have our winners! Congratulations to Meg, Terri, Janice and Kelly on winning the Math Pack Giveaway! Enjoy your calculators and pencils. Everyone else, the X-ACTO Electric Pencil Sharpener Giveaway is still going strong! Enter today for you chance to win! 9 Innovera Pocket Calculators: sized to go anywhere and handles basic computing functions. 5 Paper Mate Mechanical Pencils: perfect for standardized tests, which is great because there is always at least one kid who doesn’t have a pencil on test day. Pick up extra entries on Facebook, Twitter and Office Ink. And hurry! The Math Pack Giveaway ends next Monday, August 5. We’ll announce the winner here at Office Ink Wednesday, August 7. Good luck! Not everything is streaming online or stored on the cloud. Sometimes, you can’t get around storing and accessing data and media on DVDs. Keeping those fragile discs clean and scratch free has always been a challenge. Today we show you how to clean a DVD without scratching the surface. We’ve also got some tips on repairing DVD and CD scratches. How to clean a DVD without scratching the disc. The first trick to successfully cleaning a DVD without scratching the surface is to use the right cleaning cloth. The hem of your shirt is not going to cut it. You need a very soft cotton cloth. Microfiber works great. Microfiber cloths are reusable, and are also perfect for cleaning your smartphone, LCD laptop and tablet screens, your eyeglasses, etc. You can also clean a DVD with 100% cotton swabs and balls. Just on’t use any sort of paper product. Even the softest facial tissues are made from abrasive wood fibers that will scratch your DVD. Once you’ve got you’re cloth, you can choose a cleaning solution. A mix of dish soap and water will suffice in most circumstances. If that doesn’t do the trick, try cleaning your DVD with 99% Isopropyl Alchohol. This is most readily available in the form of specialty DVD cleaning solutions. How to repair CD / DVD scratches. Be gentle when repairing and cleaning DVDs. The old advice to lightly wipe in straight lines from the center hole to the outer edge is sound. Stubborn stains and scratches should be handled with a light hand and a ton of patience. Good luck! Got some advice on how to clean a DVD without scratching the surface, or on repairing a scratched DVD? Share your tips in the comments. Laptop screen covered in dust and finger prints? 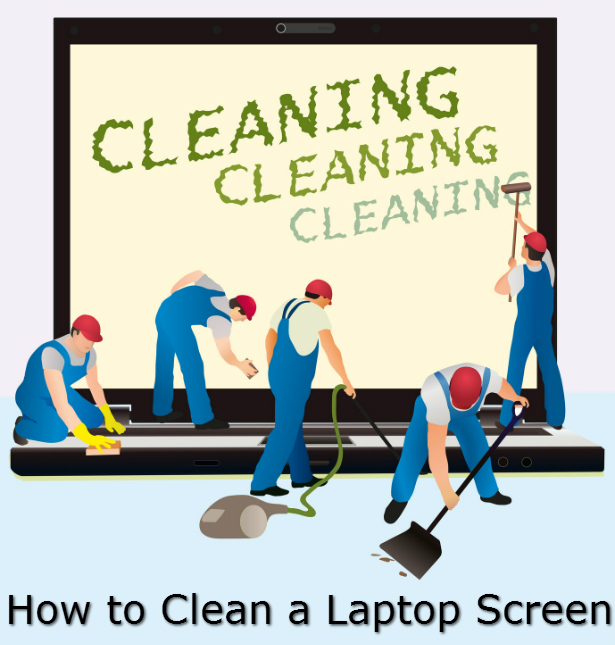 We have some tips on how to clean a laptop screen. First things first: don’t use ammonia-based glass cleaners such as Windex to clean your laptop screen. Ammonia can damage modern LCD screens. 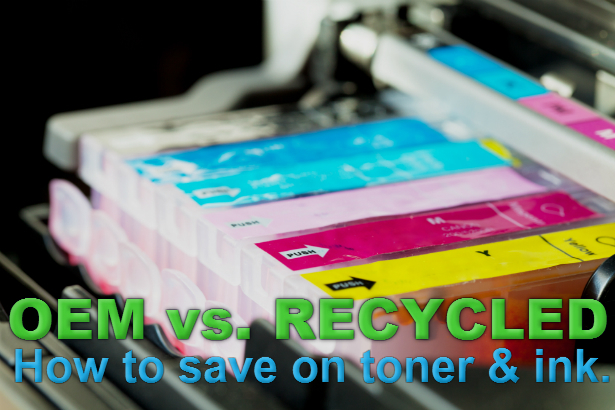 Your best bet is to use wet wipes specifically formulated for use on computer screens. The advantage of laptop screen cleaning wipes is the wipe material, specially fabricated to not scratch your screen. Plus, the cleaning solution is great for quickly cleaning fingerprint. If you don’t have any screen cleaning wipes on hand, just use a soft cloth moistened with plain water. Once you’ve cleaned your laptop screen, you may as well deal with the keyboard. Use compressed air (or hey, a Post-it note) to get rid of dust and debris under the keys. Then wipe the keyboard down with the same cloth or wipe you used on the screen. Got some advice on how to clean a laptop screen? We’d love to hear them! Leave your tips in the comments. 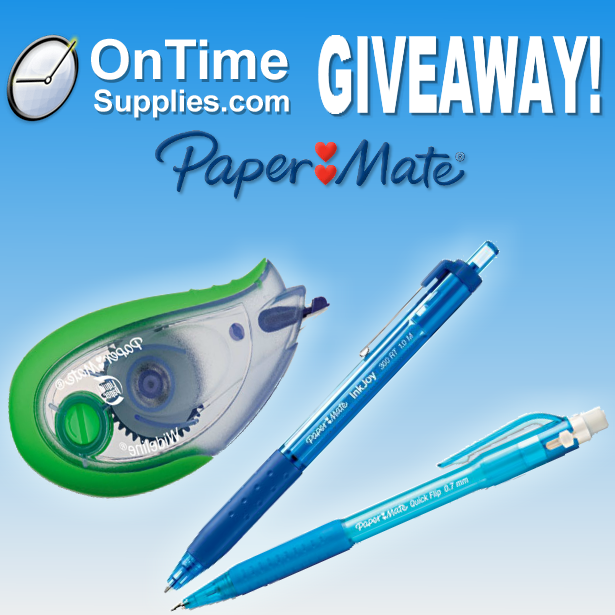 Paper Mate Giveaway: win pens, mechanical pencils & Liquid Paper! Update: We have our winners! Congratulations to Janine and Nancy one winning the Paper Mate Giveaway and free pens, pencils & correction tape! I would love to win because these are great supplies to help my 5th graders with their writing. Mechanical pencils and ball points are easy to use and write smoothly. The varied colors would be great for the editing process, which can even be done with a friend to give you suggestions in cool colors! Oh! So many possibilities. For the last several years, I have donated supplies to children in my neighbor whose parents couldn’t afford to give them what they needed for school. Everyone is experiencing hard times and I have come to believe that it takes a village. Also, as many teachers, I spend more money than I can truly afford on supplies for my classroom. See, I teach in an area where many of our students come from broken homes and many are homeless. Winning these supplies would go a long way and I would love to share with the children who have touched my life. Looks like both our winners will make great use of their prizes! Congratulations again! The Paper Mate Giveaway is over, but our Math Pack Giveaway is just starting! 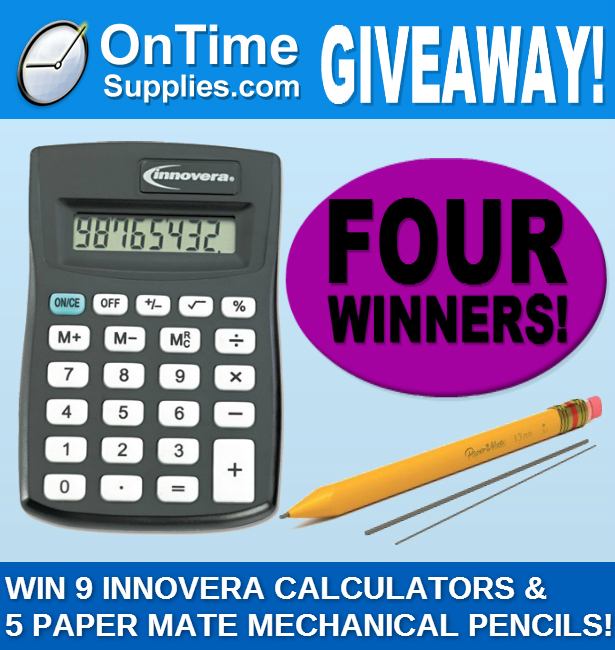 Enter today for your chance to win extra calculators and mechanical pencils for your class. And don’t forget: today is the LAST day to enter the awesome Back to School Giveaway and $500 in free school supplies. Good luck! Paper Mate Inkjoy Retractable Ballpoint Pens: two dozen in a range of colors –from basic black and blue to fun orange and purple pens! Paper Mate Quick Flip Mechanical Pencils: a doze smudge proof pencils featuring two-in-one erases that last twice as long as standard mechanical pencils! Paper Mate Liquid Paper WideLine Correction Tape: tear-proof Liquid Paper correction tape size to completely cover handwritten mistakes and typos! Get extra entries by entering on Facebook, Twitter and Office Ink. And hurry! The Paper Mate Giveaway ends next Monday, July 29. We’ll announce the winner here at Office Ink Wednesday, July 31. Good luck! New office furniture is a significant investment for any business. Leasing, with its lower upfront costs may seem a tempting option, but there are definite advantages to buying new office furniture outright. Before you sign any contracts, consider the benefits of buying versus leasing office furniture. Why you should buy new office furniture instead of leasing. 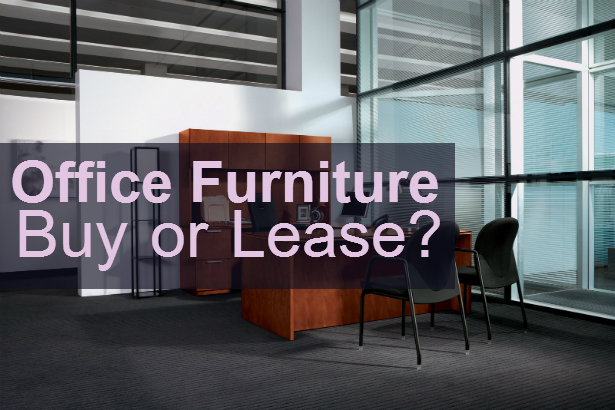 It’s cheaper: those monthly lease payments add up, jacking up the total cost of your office furniture. And no matter what kind of month you’re having, you’ve got to make your lease payment. It’s yours: owning your office furniture allows for greater flexibility. You can upgrade or downsize your furniture whenever you need too. You can even sell it if worse comes to worse. When leasing office furniture, you’re locked into a contract you have to honor, no matter how your needs change. It’s a better tax deduction: while you can write off purchases and leasing payments, outright purchases offer a much bigger tax deductions. It adds value to you business: buying new office furniture gives you assets to put on the books, instead of the liabilities of lease payments. On Time Supplies features tons of wholesale bulk office furniture bargains that fit the needs of any budget. Check out the selection online, or call us toll free with any questions at 866-501-6055. 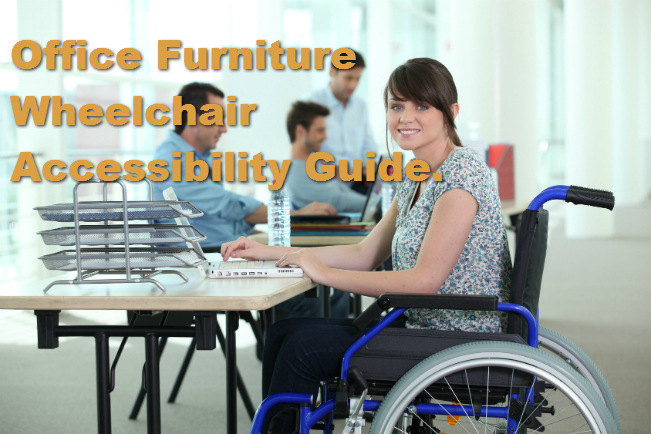 We’re happy to help you find the right office furniture for your busines. Update: We have our winners! Congratulations to Jennifer and AnnaMarie for winning the Elmer’s Glue Stick Giveaway! This time of year, teachers search through sales ads looking for the best price for school supplies for the coming year. We all have students who cannot afford supplies and so we dig deep into our pockets to provide for them so that they can be excited about returning to school too with brand new school supplies. My colleague and I just discussed the other day where we might find the best price for glue sticks. We both teach 130+students in our 3rd and 4th grade Science classes. With so many students, we tend to go through glue sticks quickly making models, creating foldables and working in our journals. We would love to win Elmer’s glue sticks for our students. Thank you for offering such a wonderful giveaway. I am a kindergarten teacher and do many projects using glue sticks with them. Many children, coming into kindergarten, need the fine motor skills of cutting and gluing since they were not given those opportunities prior to starting kindergarten. Having strong fine motor skills helps make drawing, coloring and writing much easier! I also have 2 teammates that I would happily share the supply. Thanks for the opportunity!! Hope you guys have a great school year! Congratulations again! And thank you to all the participants! Don’t miss our new Paper Mate Giveaway and your chance to win dozens of Paper Mate pens and pencils, plus Liquid Paper correction tape! Good luck! We’re giving away TWO prize packs this week. 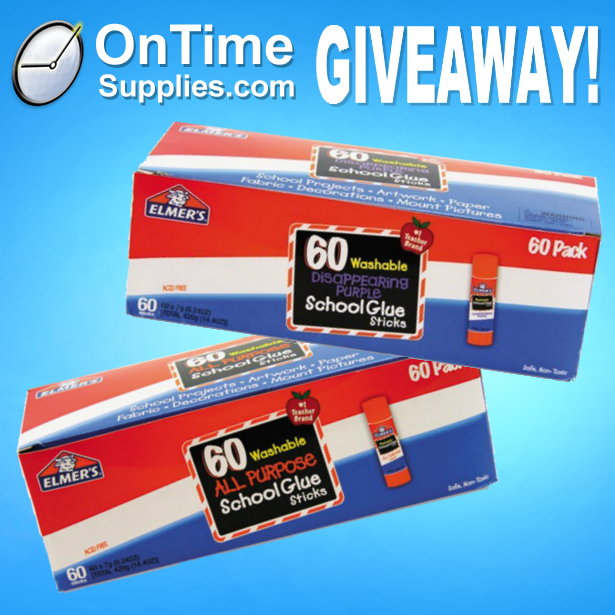 Enter the Elmer’s Glue Stick Giveaway for your chance to win a classroom-sized 60-pack of Elmer’s Washable Glue Sticks! Elmer’s dries completely clear, so it’s perfect for craft projects. And plus, these glue sticks are completely non-toxic. Best of all, Elmer’s Glue Stick completely washes off hands, clothes and surfaces. Enter now for your chance to win a box for your classroom! And remember, we’ve got two winners this week, so your chances to are basically doubled! You can pick up extra entries by entering on Facebook, Twitter and Office Ink. The Elmer’s Giveaway ends next Monday, July 22. We’ll announce the winner Wednesday, July 24. Good luck!